Saeed Rehman, MD, has been selected as the 2016 South Carolina AHEC Preceptor of the Year in recognition for his unwavering commitment to health professions students’ clinical education. 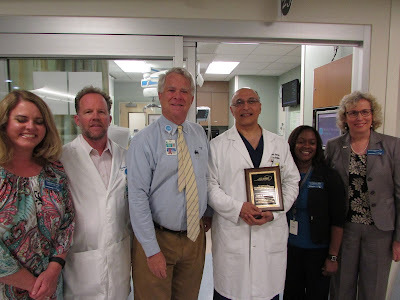 The purpose of this award is to bring recognition to an outstanding community-based preceptor serving South Carolina health professions students. Each year practitioners volunteer to provide hours of clinical education to students from various health professions. It is their dedication to the education of the next generation of health professionals that we honor with this award. Dr. Rehman has been an ER physician at Beaufort Memorial Hospital for 20 years and the emergency room director since 1999. Since 2000, he has participated in health professions students’ education. Primarily, he precepts medical students and physician assistant students. Each year when asked about his availability to precept, Dr. Rehman requests a physician assistant student for every rotation. He is always eager to precept and will often train more than one student at the same time, exposing them to a wide variety of clinical experiences. Last year, he precepted 10 students.